Heat oven to 450°F. Prepare pie crust as directed on package for one-crust baked shell using 10-inch springform pan or 9-inch glass pie pan. Spread mustard over bottom of crust. Bake at 450°F. for 9 to 11 minutes or until crust is light golden brown. Reduce oven temperature to 350°F. Meanwhile, melt butter in large skillet over medium-low heat. 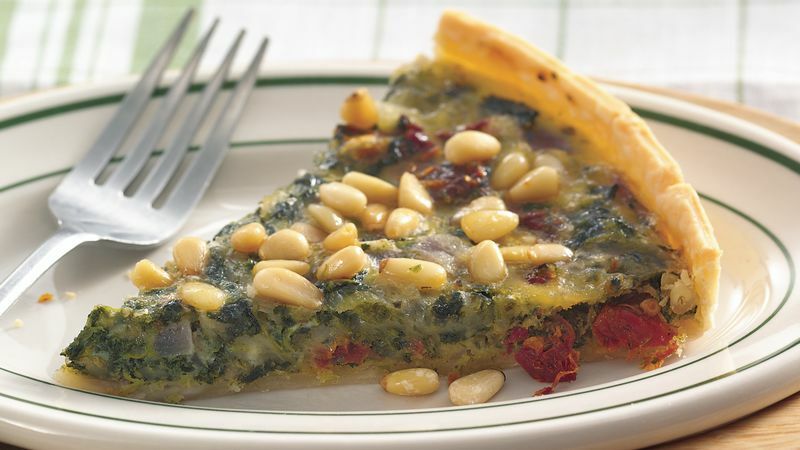 Add spinach, onion and tomatoes; cook 5 to 7 minutes or until onion is crisp-tender, stirring frequently. Remove from heat. Add Italian seasoning, oregano, garlic powder and salt; mix well. Beat eggs in large bowl until well blended. Add spinach mixture and cheese; mix well. Spoon filling evenly into partially baked shell. Sprinkle pine nuts evenly over top, pressing in slightly. Bake at 350°F. for 25 to 35 minutes or until filling and pine nuts are golden brown. Let stand 10 minutes before serving. *To quickly thaw spinach, cut small slit in center of pouch; microwave on High for 2 to 3 minutes or until thawed. Remove spinach from pouch; squeeze dry with paper towels. **To toast pine nuts, spread on cookie sheet; bake at 350°F. for 3 to 6 minutes or until light golden brown, stirring occasionally.